View More In Rope Lights - Page 3. Smart to Both Android & IOS System:The app can be download both in Android smart phone like Samsung and iPhone. Applied in Bedrooms, Living Rooms, Halls, Parties; Especially some corners that are not convenient for manual control. Just connect the WiFi controller, connectors and lights, then download the APP and use it when you are using 5.0Ghz Network. One WiFi controller can controlled by more than one phones. Timer function enables the strip lights automatically switch on/off as what you set. ♫HIGH QUALITY RGB LED STRING LIGHT: The 150 beads 16.4ft LED light strip is durable and flexible, can be twisted and fixed to be different shapes and suit various occasions. ♫WIRELESS IR CONTROLLER AVAILABLE: Packed with a wireless IR controller for remote control; Get rid of maddening wires and endless knots and allows controlling far away. ♫DOWNLOAD APP FOR SMART CONTROL: Download the corresponding APP in APP Store or Google Play, then you would start a totally new life where you can control light color, light brightness, light modes all in one app and through your phone. ♫WORKING WELL WITH AMAZON ALEXA: If you have an Amazon Echo, you may also control your lights through Amazon Alexa when you own this smart IR controller at the same time; One simple voice instruction to control lights, cannot be easier. ♫MAKING YOUR NIGHT LIVE & WONDERFUL: The IR controller will make your RGB LED light string more dynamic since you can choose light color, light brightness and lighting modes as your preference, even dancing with music rhythms. If you have any questions about this product by LUNSY, contact us by completing and submitting the form below. If you are looking for a specif part number, please include it with your message. 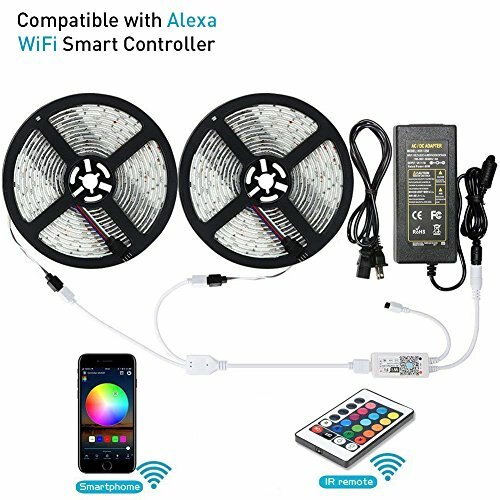 LED Rope Lights, 50ft Flat Flexible Light Strip, 6000K Daylight White, Water Resistant for Both Indoor/Outdoor Use, Inter-Connectable, UL Certified, Decorative Lighting for Any Location.